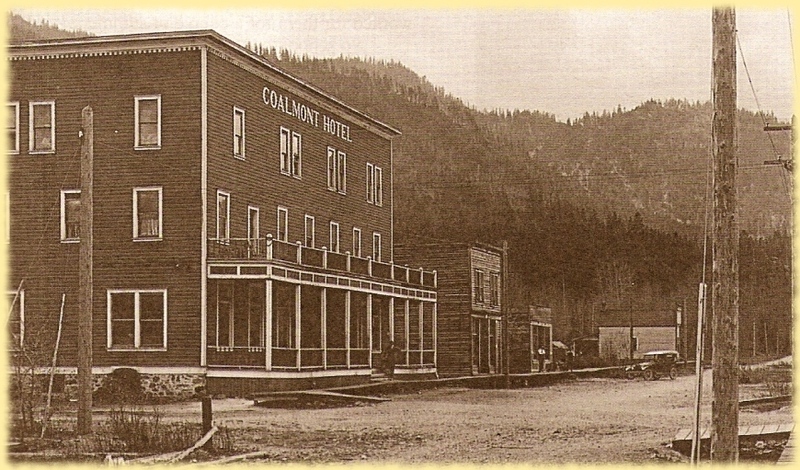 Coalmont Hotel the month before it opened on April 24, 1912. Horses were still standard transportation. Photo from Babe Norton. Automobiles were already common by 1929. The bank and drugstore were also located along Main Street. Main street was still not paved in 1939 and the mine closed the year after. Most people moved away in 1940 and Coalmont was nearly a ghost town. Here, in 1955, the bank is boarded up but the Hotel was still accepting customers. For many years the Hotel was the only business in the area - apart from Walt Smart's Store where you could get gas and mail a letter. The store closed in 1988 and the trains stopped running the year after. The Coalmont Hotel has had numerous owners over the years. Below is a timeline generously provided by Diane Sterne who's book White Gold and Black Diamonds details the history of Granite Creek and Coalmont. 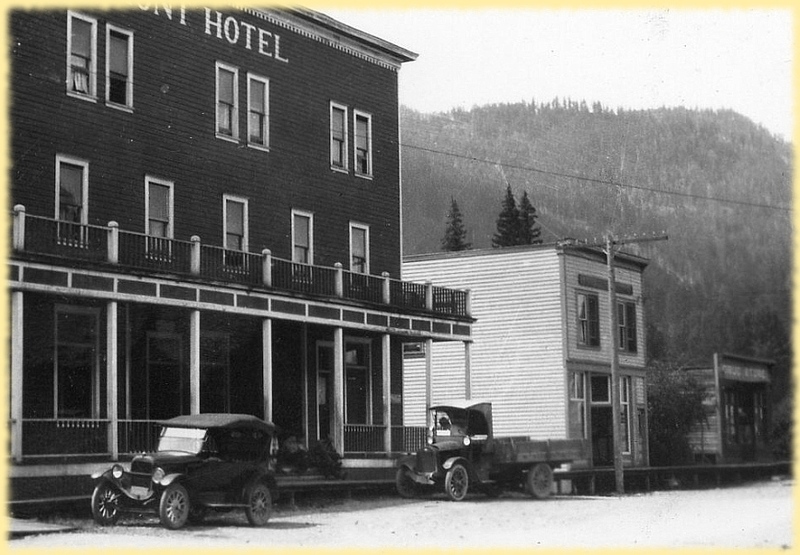 1910 Louis Napoleon Marcotte sells his interest in the Granite Creek Hotel to Herbert Goodison of Merritt. 1911 Marcotte partners with J.T. Ryan to build the Coalmont Hotel. The contractors to build the hotel are A.V. Anderson and P. McRae. The building is 55 ft by 76 ft. The cost to build it is $26,000 and the construction time is 60 days. The hotel’s original colours are CPR red with white trim. On September 11, 1911 at the home of her parents in Princeton, Myrtle Schisler marries Louis Marcotte. The couple honeymoon via the Great Northern through Washington. Wednesday, April 24, 1912 is the grand opening ball of the Coalmont Hotel to celebrate its opening. 200 people were in attendance and music was supplied by the Princeton Orchestra. 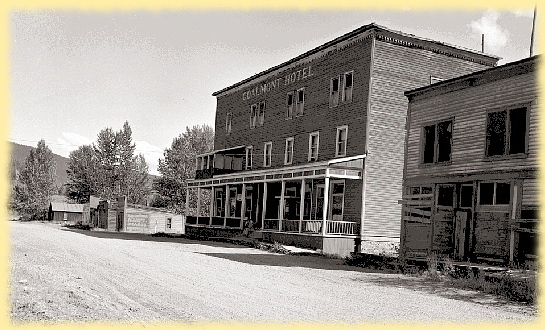 The 3 storey Coalmont Hotel was described as “fully modern” with “ample bath accommodation” and the “finest between the coast and Spokane”. On June 28, 1912, A Swedish man named Justice Johnson (age approx. 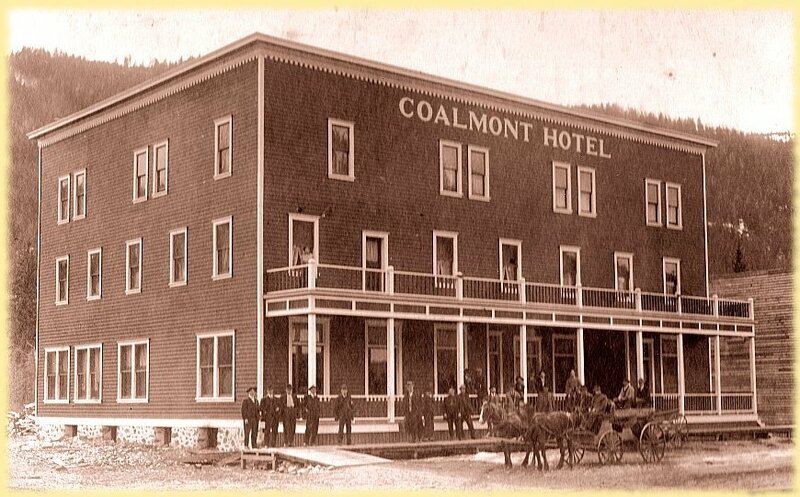 63) collapses and dies in front of the Coalmont Hotel. He was hired to grade the streets. His death certificate lists the cause of death as a broken neck. He is buried in Princeton. On September 12, 1912 Myrtle Marcotte dies in childbirth at the home of her parents in Princeton. She was 19 years old and is buried at the Princeton Cemetery. She gave birth to a baby girl (also named Myrtle). Her parents raised the baby but she frequently visited her father (Louis Marcotte) in Coalmont. Marcotte remarries in Vancouver on December 1, 1921 to Mary Faulds and they continue to operate the hotel together until 1922. Louis Marcotte dies on July 5, 1948 in Tulameen when a prospecting tunnel collapsed and he was buried in mud. He is buried at Princeton Cemetery with his first wife. Mary Marcotte dies on August 27, 1979 and is buried at the Granite Creek Cemetery. Mrs. Marcotte was instrumental in helping douse a serious Coalmont fire on December 2, 1928. She worked tirelessly hauling bucket after bucket of water to help put out the fire that engulfed a store and livery stable. In 1916, Ryan sells his share of the hotel to Louis Henry “Harry” Brooks who was described as “a happy-go-lucky cattleman and butcher”. The town of Brookmere (originally called Brooksville) was named after him. Brooks was originally from Charleston, Illinois. One month later (July 2, 1912) Brooks dies of apoplexy at the Coalmont Hotel and is taken to Brookmere for burial. In l917 all liquor licences in British Columbia are cancelled due to prohibition. Beer is replaced with “near” beer (less than 2% alcohol). In November, 1920, Louis Marcotte testifies at the inquisition into the murder of town madam, Hattie McBride. Mr. Marcotte admitted to borrowing a few hundred dollars from McBride. While his testimony suggested that he may have known who the murderer was, he refrained from dropping any names. 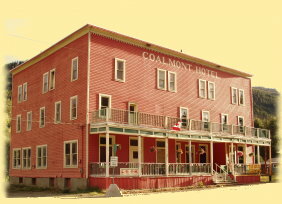 In 1922 James McKiernan and Frank M. McMahon purchase the Coalmont Hotel (note that the McMahon Stadium in Calgary is named after Frank and his family). In 1922 picture shows are shown at the hotel on Saturday evenings for 35 cents (adults) and 15 cents (children). In 1928 the Miller brothers operate the hotel and in 1930 David “Jerry” Paterson Brown becomes the owner. He purchases the hotel for $7,000 from the Nelson Brewing Company. On July 14, 1930 Jerry marries Elizabeth McKay Miller. Jerry and Liz rent rooms at the Coalmont Hotel for $2 per night and meals cost 50 cents. They charge locals 50 cents to use the bathtub in the hotel (most homes did not have bathtubs of their own). The staff in 1930 consists of a cook, helper, girl in the dining room, a maid, and a night watchman. The hotel originally has steam heat but after the system blows up, the hotel is heated with coal. After the mines close down, sawdust is used for heat. The hotel had 35 rooms, a cafe and pub. An ice house behind the hotel held 150 tons of ice which was covered in sawdust and used as needed to keep the beer cold. A chute running from the ice house to the basement of the hotel made it easier to move the ice. The hotel (one of only 5 businesses in Coalmont with a telephone), charged 2 cents to take a message and the telephone ring was long-short-long. In the 1940’s a barbershop was in the front room of the hotel and dances and school concerts were held in the dining room. In 1960, after 30 years running the hotel, Jerry and Lizzie retire. A retirement party is held for them in the hotel on July 30. On August 6, 1960 (only one week after their retirement), Jerry dies of a heart attack. He is buried in Princeton. Mr. and Mrs. Fred Norheim purchase the Coalmont Hotel from the Browns for $17,500. In 1967 the hotel is sold to Ralph (“Deacon”) and Dawn Pennock. In 1983 Gerry and Diana Slobad own the hotel and auction off various items from the building. Timeline and historical photos from White Gold and Black Diamonds – The History of Granite Creek and Coalmont by Diane Sterne, proprietor of The Mozey-On-Inn. Site and pictures (unless othewise noted) copyright ©2012 Ole Juul.